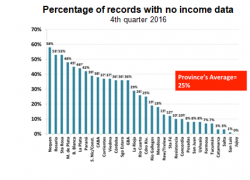 The update of the report on the incidence of poverty indicates that in the second half of 2017, 18% of households and 26% of the population of the 31 largest urban agglomerates in the country are poor. This is, they have total family incomes of AR$11 thousand per month, on average, which prevents them from reaching the value of the average Total Basic Basket, estimated at AR$17 thousand per month. INDEC poverty data must still be taken with extreme care due to the fact that there are signs of deficiencies in the information gathering. 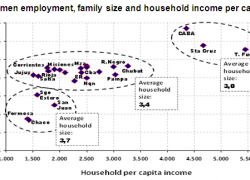 One of them is that approximately 20% of the households making up the sample, with a great dispersion depending on the city considered, do not have the total of their incomes reported. In any case, at more aggregated levels, information reliability increases. If inflation remains around 20% per year, poverty levels will be 24% of the population. If inflation decreases to 15% in annual rates –the target set by the Government– poverty will be reduced to the 23% of the population. If inflation was 5% per year –regular level according to the experience of neighbouring countries– the 20% of the population would be affected by poverty. 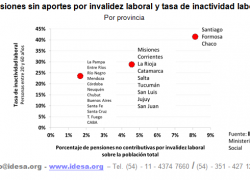 This data shows that the adopted inflation target is very modest in terms of social achievements. Assuming that the inflation target set by the Government will be met, the reduction of poverty would be minimal. The reason is that increases in the price level keep on being very high, what damages family budgets, specially, those of the humblest people. The other relevant point is that these simulations show that, even when reaching inflation rates close to 5%, poverty will remain high. This confirms that lowering substantially inflation is a necessary, but not a sufficient condition, to move towards the goal of Poverty Zero. The behaviour shown by inflation in the first months of 2018 gives a warning signal. Inflation tends to be at higher levels than those observed in the last months of last year, which means that poverty will stop falling and may even reverse its downward trend. For the reduction of poverty observed in the second half of last year not being an ephemeral phenomenon, it is necessary to put in order the public finance to give sustainability and speed to the process of reducing inflation. To move forward in this direction, it is essential to stick to a strategy that contemplates a correct execution of roles between jurisdictions. The national government should assume that its main contribution to lowering poverty is to reduce inflation. This highlights the social transcendence of increasing the speed in the ordering of public finance. Therefore, it is essential to eliminate a large number of national programs in education, health, social development, housing and urban planning that overlap with provincial and municipal functions. Even though it may seem contradictory, these programs do not contribute to improving the social situation but to increase inefficiencies. In line with the facts mentioned above, a comprehensive reform of the pension system that reduces imbalances by eliminating overlaps of benefits and treatments for certain groups of people is also vital. By reducing inflation to normal levels (5%), the challenge of reducing structural poverty (20%) becomes more explicit. For this, it is the provinces and municipalities that must efficiently assume the management of education and public health systems, urban planning, housing, security and social assistance, since these are their responsibilities. The Nation has no possibilities of replacing them in these functions but can contribute by encouraging the adoption of good practices. A key task in this direction is to measure and publicize results in order to promote greater social control in each community.